Today I set about figuring out how to draw the profile of the back, which has a 15' radius arch, onto the sides. It was the first time I'd ever used the excellent and simple method described by Colin Symonds over on the "Official Luthiers Forum" --- in his method, you place masking tape on the bottom edge of your mold, place the mold on top of the radius dish, and then run a pencil stuck in a scrap of wood along the radius dish around the mold; this marks the arch of the dish onto the masking tape, which you then transfer to your drawing of the side. Here's the thread which describes the method. 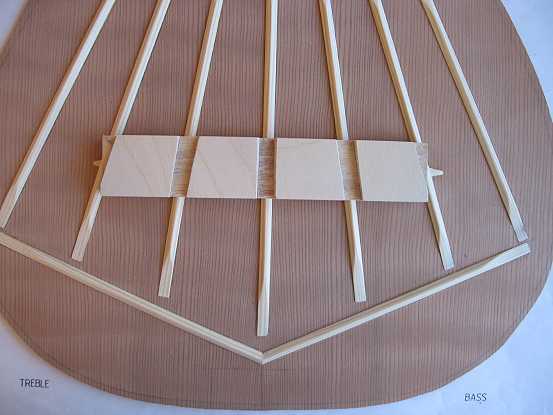 I made a paper template, marking first the total length of the side, marking the heights of the neck end and the tail end, and then placing the ends of the back arched profile line to meet the neck and tail lines. I also marked the line for the waist. Then, I taped the paper template to one of the sides (after having jointed one edge flat, for the top edge), marked the profile, and taped the other side to it (making sure I had place them in "mirror-image" positions). Then, it was off to the bandsaw to cut out the sides (with a couple of inches extra at each end). To the right is the result. Tomorrow is the BIG DAY.....bending the sides! I will use a slightly different method from what I've used before: this time I will be making the "sandwich" in this order --- slat (.012" spring steel), wood, slat, heating blanket, slat. Previously I'd done it with the slat first, then the blanket, then the wood. But, this new way, the side should fit the mold more accurately. 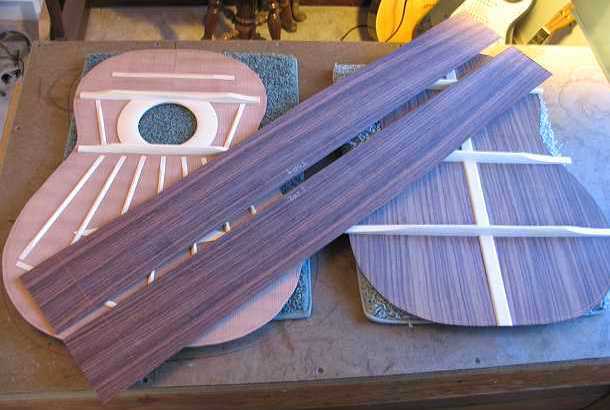 It should go pretty easily, as these sides are pretty thin (about 2mm), and rosewood always bends easily. 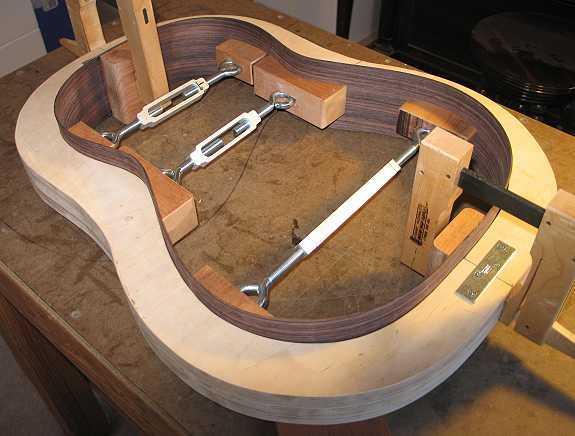 Yet, even so, I always get a little bit nervous when bending sides!